In this article, we continue our series on securing your MEAN stack application, by taking a look at how cyberattackers can find vulnerabilities in your ExpressJS code. Before jumping into the Express framework, get up to speed with Part 1 of this series which explores MongoDB. The Express framework allows developers to easily add multiple middleware plugins globally to all routes via app.use(). However, middleware order is important because it will only be applied to routes defined further down the stack. Consider the code block below where the isLoggedIn authentication middleware is applied after the /secure/removeInvoice route. The authentication check will be applied to requests for /secure/addInvoice but not /secure/removeInvoice. 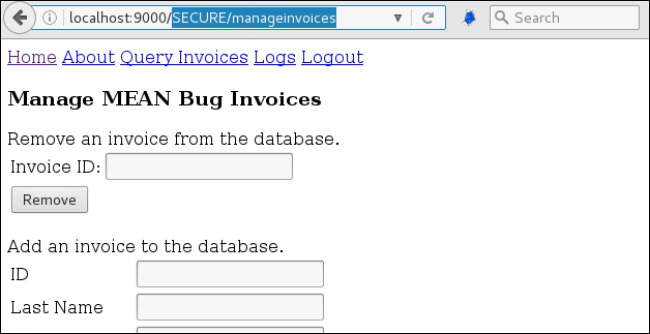 An unauthenticated attacker can submit requests directly to the /secure/removeInvoice API and delete invoices. When applying middleware globally (rather than inline, per route) developers should make all app.use calls at the beginning of the file, before defining routes that must be restricted by the applied middleware. The Express server framework allows developers to easily define routes for serving static pages or RESTful APIs; however, these routes are case-insensitive by default. This becomes problematic when applying middleware security controls to routes based on regular expression matching. For example, our MEAN Bug application uses the isLoggedIn middleware function to verify that a user is authenticated. This middleware is dynamically applied to all routes that begin with the case-sensitive string /secure via the express-unless plugin. Because Express routes are not case-sensitive, a request for /SECURE/manageInvoices will return the same resource as /secure/manageInvoices. However, the authentication checking middleware will not be applied to /SECURE/manageInvoices, allowing an attacker to access the page without logging in. The isLoggedIn authentication middleware should be applied to each /secure route based on a case-insensitive regular expression denoted by the ‘i’ option after the trailing forward slash. Alternatively, the Express application can be configured to use case-sensitive routes by setting the case sensitive routing option to true. The screenshot below demonstrates the second solution where the server is configured to use case-sensitive routing. The request for /SECURE/manageInvoices is no longer valid. Stay tuned for Part 3 of this series, exploring Express Sessions and CSRF. Published at DZone with permission of David Bohannon , DZone MVB. See the original article here.